Fifty years: That’s 10 U.S. presidents. It’s also real estate bubbles, recessions, economic booms, gas prices rising and dropping, rising and dropping, and rising, rising, rising. Traffic lights on Highway 101 giving way to widening projects on Freeway 101. Pay phones becoming cell phones. New planets found and old planets lost. Scores and scores of musical fads playing out on records then eight-tracks then tapes then CDs and now MP3s. 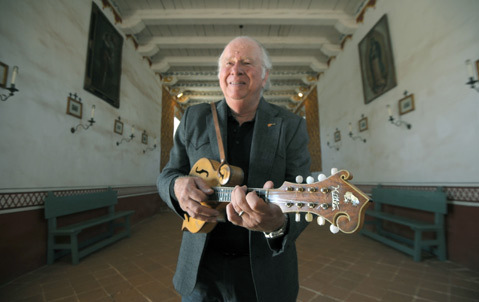 And through it all, Peter Feldmann has been living a life less ordinary, picking at strings and giving the people of Santa Barbara that sweet, soulful, body-moving American-made music we call bluegrass. “I feel like I was a different person back then, but I just can’t remember who it was,” laughed Feldmann recently when asked about the origins of a music career that started around these parts in the early 1960s. It was midmorning, and we were catching up on the telephone, me at Independent headquarters here in Santa Barbara and Feldmann at a friend’s apartment in Oakland, taking a break from a jam session that had more or less spilled over from a gig the night before. I had caught him in the middle of a music-motivated road trip in honor of Bill Monroe’s birthday (i.e., the late, great patriarch of bluegrass). It seemed a perfect backdrop for getting the lowdown on Feldmann’s half century of music making. After all, this is a man who cut his chops with the likes of the Seeger family at Chicago’s Old Town School of Folk Music. He also ran the famed Bluebird Café in Santa Barbara and founded Santa Barbara’s Old-Time Fiddlers’ Convention. His band The Scragg Family handled house-band duties for the infamous Red Dog Saloon in Virginia City, Nevada, and provided the soundtrack for the bohemian glory days on Mountain Drive. Be it on the guitar, fiddle, banjo, mandolin, or behind the scenes as a promoter and producer, Feldmann has a story that’s the gritty, glorious, and goodtime-having embodiment of American string music. After flunking out of UCSB in 1960, Feldmann set out for Chicago, where he spent his days working in the Field Museum of Natural History and his free time soaking up everything and everyone at the famed Old Town School of Folk Music on the city’s North Side. The experience, which included regular time with the likes of Pete and Mike Seeger and Tracy Schwarz and Frank Proffitt, turned his growing passion for music into an absolute obsession. “I came back [to Santa Barbara] after having this tremendous music experience, and I wanted to share it with people,” recalled Feldmann. And, well, that is essentially what he has been doing ever since. It began with an informal “hootenanny” at Orpet Park in 1962 with no PA or major advertising but more than 150 people in attendance. Then, after rejoining the undergrad ranks at UCSB, Feldmann, high on the folk revival and subversion efforts of the times, started the Old Time Music Front, an outfit dedicated to “subverting college kids into listening to old-time traditional American music, warping their minds and doing as much damage as I could.” It was in this role that he started putting on shows in earnest. People like blues legend Mance Lipscomb and folkster John Cohen and Mississippi Fred McDowell all came to town on the circuit between L.A. and San Francisco thanks to Feldmann. Even better, at least for the sake of Feldmann’s personal musical development, the artists would often crash with him at his self-described “shack” in Goleta. “I would just try and learn some licks, put on a show, and then send them on their way. It was a special time,” he said. Peter Feldmann takes the stage at the Lobero Theatre (33 E. Canon Perdido St.) in celebration of his 50th anniversary of music making this Friday, November 2, at 8 p.m. The lineup includes performances by David West, Byron Berline, Alastair Greene, Tom Ball, and Kenny Sultan. Call 963-0761 or visit lobero.com for tickets and info.